Take a peek inside my bedroom. I need your help! Our bedroom is simple. It is not large enough for any seating, so the only furniture is the bed, side tables, dresser and armoire. I don’t spend a lot of time in the here, but wanted a calm feeling, nevertheless. The walls are a khaki color. I was amazed at how difficult it was to find a duvet that matched the khaki. There are a lot of subtleties to the shade. I made the pillows to add a bit of punch to the room. I also made the dust cover. The dust “ruffle” is necessary because I store suitcases, yarn and a few wedding dresses under there. (I’ll save that for another post…but my Twitter friends may have heard it.) I wanted a tailored dust ruffle, but most available in retail were not long enough for my bed which is higher than standard beds. Also, they didn’t have a break at the corner, so it wouldn’t hang properly. So I took a fitted sheet and stitched rectangles to it. Fairly simple, although I didn’t do a good job of smoothing out the wrinkles for this photo. What are those things sticking out of the bed? Those are our reading lamps. Have you ever bought clip on lamps and wondered how you are supposed to clip them onto anything and still be able to aim them at your book? Most are impossible! So my husband built a wooden post behind the headboard and we have very low wattage lights in the lamps so that we can read at any time of the night. If I had an unlimited budget I would have designed a room with indirect lighting and small, narrow recessed spots in the ceiling….but I can only dream. I don’t even have any artwork on the walls! So here’s where you can help. I have been thinking about making a new duvet cover or even venturing to make a quilt. I’m torn between the tranquil neutral color of the room and having something a little more interesting. I searched on “modern bedroom quilts” and pinned a few ideas to my Pinterest account here. If you have any ideas for me – anything from suggestions of artwork for the wall to quilts to duvets to fabrics, please throw them at me! For our bedroom I’m going to have some of the photographs we’ve taken of landscapes enlarged and framed. The places we loved enough to take pictures of give me that tranquil feeling. I love the duvet patterns you pinned. They all have a quilted look. Maybe you could pick one or two two colors and the neutral you are working with and do a cover in that scheme. It looks like the pillows you made are a red color, a contrasting color like apple green (or a bit more toned down zen green) might be nice with the khaki (and the honey colored wood furniture). Or you could go with something more harmonious like mid tone blues or purples. This is fun! I think we may have the same bed. 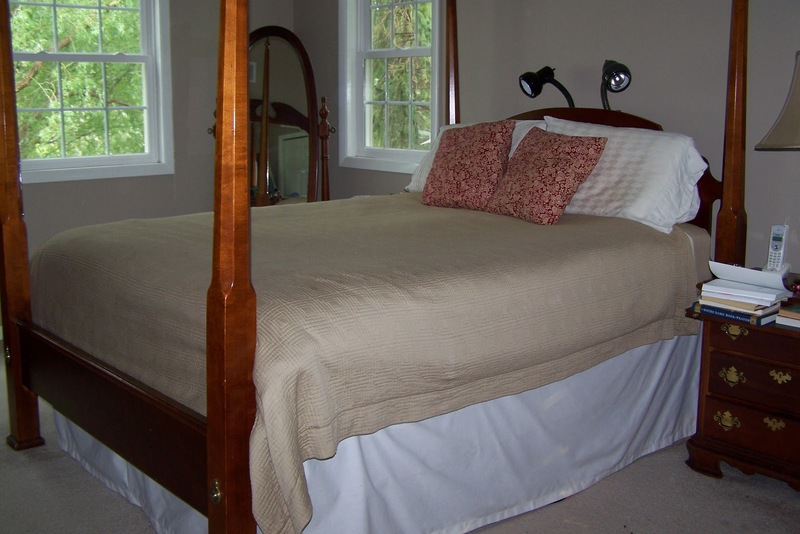 Ours has a red damask comforter on it—I know most people love a soothing bedroom. I love red, so it feels great to me! And cozy this time of year. Have you thought about hanging some curtains–something with a more modern graphic print would liven up the space. Adding some large Euro shams would possibly conceal the reading lights during the day–but they would still be useful at night. It will be fun to see what you do. Just do what YOU love because you really want to enjoy your space!